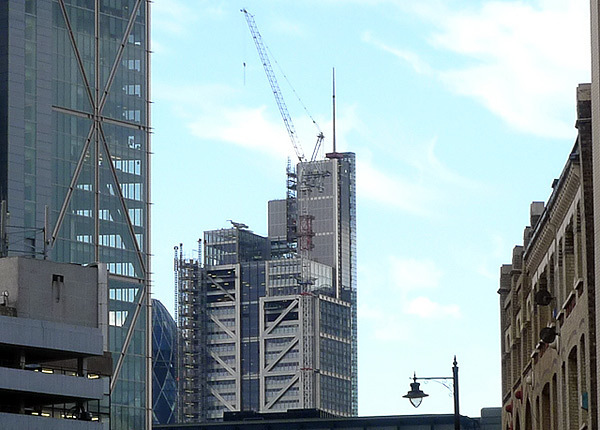 Yesterday morning the 28m-long spire was craned into place on the top of the Heron tower on Bishopsgate. Depending on your point of view, the spire increases the building's height to 230m, or is in fact nothing more than a bauble, with the tower's true height remaining 202m. Despite the mild controversy (heavily debated over at SkyscraperCity), this is the first tall building in London to get a spire. From a distance the spire adds an elegant touch to the Heron; however, up close the effect is less impressive, as it seems somewhat out of scale with the building's shape. The original design called for a spire of 40m, which may explain why this truncated version doesn't quite work. The Heron tower is due to open early next year.